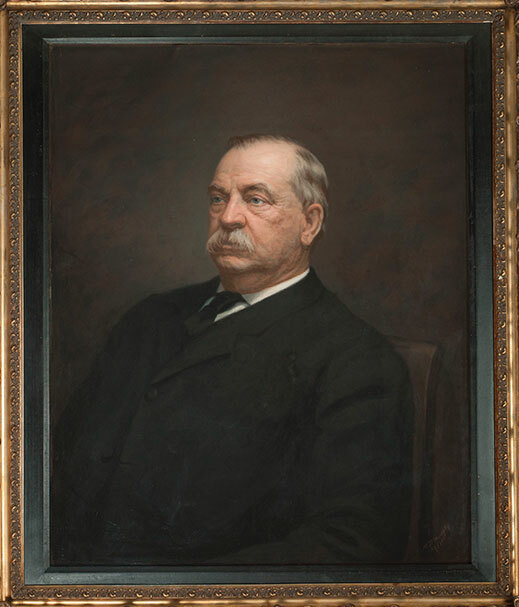 Grover Cleveland was born in a modest, wood-framed house in Caldwell 180 years ago this month. Today, that house is a state historic site. The Grover Cleveland birthplace in Caldwell. You might know Grover Cleveland as the only U.S. president born in New Jersey. But he had other distinctions. He was the only president to serve two nonconsecutive terms. He was also the first president married in the White House, to Frances Folsom in 1886. Their second child, Esther, was the first baby born to a president in the White House. Cleveland’s birthplace, a modest, wood-framed house in Caldwell, is a state historic site—one worth visiting for anyone with an interest in history. Give a half turn to the front-door bell, and you’ll likely be greeted by Sharon Farrell, caretaker since 1980. The house is carefully preserved, with original flooring, period furnishings and Cleveland family artifacts. Cleveland was born in the house 180 years ago this month. Remarkably, he has four living grandchildren. One of them, 64-year-old George Cleveland, bears a striking resemblance to his burly granddad, right down to the balding pate and bushy mustache. On occasion, George has portrayed his presidential ancestor—as he did in 2014 for a reenactment of Frances and Grover’s White House wedding. The event at the Essex Fells Country Club raised funds for the Grover Cleveland Birthplace Memorial Association. In the Cleveland home’s front parlor, a series of exhibits documents Grover’s interests (he was an avid fisherman) and career. Farrell or one of her assistants will provide a detailed tour of the house, or you can take a self-guided tour. If you ask, Farrell—an alto—will even gently sing a period song for you. The museum is open Wednesday to Sunday; admission is free. Call 973-226-0001 for hours. How is it that four of Grover’s grandkids are still among us? Grover was 60 and Frances was 33 in 1897 when she gave birth to their fourth child, Richard, who married twice and had six children. The six included Grover’s four surviving grandchildren, ranging from 89-year-old Thomas to George’s kid sister Margaret, born in 1956, when Richard was 59. Being a presidential descendant gives George a great appreciation of history, but provides no special perks. “I have to pay taxes and use stamps,” he declares. George plans to attend a March 18 wreath-laying ceremony at his grandfather’s grave at the Princeton Cemetery, where Grover and his wife are buried alongside their first child, Ruth (for whom the Baby Ruth candy bar was named). The same day, a tea social at St. Peter’s Episcopal Church in Essex Fells will celebrate Grover’s legacy. For tickets, call 973-228-1293. A vintage woodcut depicts Grover Cleveland's White House wedding. George Cleveland at a 2014 reenactment of his grandfather's White House wedding. Read more Historic Jersey, Jersey Celebrities articles.